can provide thrust. The engine must operate to accelerate the vehicle as well as decelerate the vehicle at the end of the trip. So for the 9.5-year one-way mission the engine must be in storage for 9 years before it is needed again to decelerate the vehicle. For the two-way mission there are two 9-year storage periods in sequence. For this mission the acceleration, acceleration times and thrust are given in Table 1.8. One of the rules of thumb in space operations within the Solar System is that 1000 s specific impulse and 1000 newtons are in the correct ratio for a proper system. You can see this is the case for the lower acceleration of 0.032 "g" (0.314 m/s2) and a travel distance less than the distance of Pluto, about that to Neptune. The 1000/1000 criterion applied to Pluto means that the travel time would be 12.1 years, not 9.5 years. These criteria pose a challenge to existing propulsion technology (basically, chemical, with electric propulsion playing a relatively minor role in satellite propulsion). At the same time, in-orbit assembly of spacecraft and propulsion systems may ease the single lift to orbit requirement but assembly in space adds to the complexity and uncertainty of the mission. Structures of future spacecraft assembled in space may be made much lighter, without the need to withstand launch loads completely assembled. Propulsion system options meeting the 1000/1000 criterion and using Newton's Third Law are ''nuclear'' and ''electric'', or their combination. 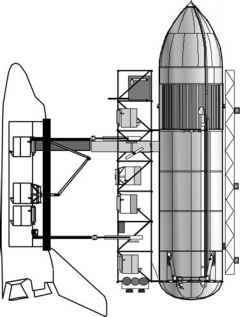 Conventional (thermal) nuclear propulsion (NP) has been tested through the 1970s (NERVA engine), resulting in an Isp ~ 900 s and thrust ~ 9 x 105 N, more than sufficient for a booster or launcher, but not quite adequate for long interplanetary travel. This type of nuclear propulsion (as will be shown in Chapters 3 and 5) is perfectly suited for RLV upper stages lifting heavy payloads to orbit, and also for lifting payloads from LEO to geostationary Earth orbit (GEO), powering, for instance, a ''space-tug''. Direct heating of a propellant gas by the fission fragments (FF) has been proposed by C. Rubbia. In principle at least, the melting point of material problem is bypassed. This should indeed produce a combination of specific impulse and thrust in the range desired for Solar System travel. A somewhat similar concept uses nuclear power to heat inductively a propellant, as done in wind tunnels using a Plasmatron (for instance, in the Von Karman Institute PWT facility). Electric propulsion (EP) comes in many varieties. Common to all, however, is a typical low thrust per unit mass, and, for some, even the thrust per unit cross-section of the device, while the specific impulse may be more than adequate: for instance, commercial ion thrusters are now capable of 4000 s. To achieve the specific impulse and thrust combination already mentioned, magneto-plasma-dynamic (MPD) thrusters are now considered the best choice. They accelerate a plasma by the Lorentz force F = j x B, where j is the current flux and B the magnetic induction. MPD propulsion still needs large power to achieve a thrust of approximately 1000 newtons. Proposed solar power arrays would need acres of photovoltaic cells to harvest it and feed it to a MPD thruster, say, for a manned Mars mission. The combination nuclear power/MPD looks instead very appealing. Belonging to this same family is the so-called VAriable Specific Impulse Magneto-plasma-dynamic Rocket, or VASIMR, in which the concept is further refined so that for a fixed power the product F x Isp is fixed, and either low F and high Isp, or vice versa, can be obtained. This feature makes simpler an interplanetary trajectory from a LEO. Thus, either direct nuclear propulsion perhaps of the Rubbia type, or a combination nuclear power plus electric propulsion are the current candidate propulsion systems for Solar System exploration; see Chapter 7. The Rubbia concept could also function as a nuclear generator, and could be alternative to VASIMR. In any event, about half of the nuclear power of any nuclear-powered system would be wasted and must be radiated away or recycled. A recycling application could consist in converting the waste power into electric power for a downstream electric propulsion thruster, or to boost the performance of the main electric propulsion thruster. Although sketchy, these considerations show the importance of detailed energy and power budgets in planning efficient propulsion systems from basic concepts. A relative newcomer technology that will help MPD propulsion is superconductor (SC) technology. Large B fields imply large and heavy conventional coils. Ohmic heating of the coils limits the B fields in ground applications to 1 tesla (T) at most. On a space vehicle lack of convective cooling would pose even more severe limitations. If, however, coils are made of materials kept superconductive either by active cooling or by using a cryogenic propellant such as LH2, the magnetic field could be raised to as much as 10 tesla with a drastic reduction in mass and volume. Superconductivity will likely play a large role in future propulsion fed by nuclear power. Two alternatives to the nuclear and electric propulsion systems should be mentioned, although they are incapable at the moment of satisfying the travel time requirement of even a few years at most. They are the solar sail, and the magnetic sail. They look appealing, largely because they do not need, especially the former, complex hardware, and certainly very little or no power generation. Solar sails exploit the radiation pressure of photons (light) emitted from the Sun to push a large surface (the "sail"), properly oriented in space (Poynting vector) much in the same way as the wind on Earth pushes a sailboat. The thrust level available is exceedingly small, decreasing with the square of the distance from the Sun. This limits the usefulness of the solar sail to Mars or the inner planets. Contrary to what is intuitively assumed, the radial direction of the thrust can still be used to sail "against the wind'' and be used for interplanetary missions to the inner planets. Structural mass and low thrust rule out this propulsion concept for manned missions. [Seboldt and Dachwald, 2008]. Magnetic sails work similarly, but the effect exploited is the solar wind (mostly ions) also radiating away from the Sun. However, instead of using their weak pressure on a physical sail, the spacecraft would generate a "frozen" magnetic B field inside a plasma cloud emitted from the spacecraft. The interaction between solar wind (i.e., the solar current) and the B field creates a Lorentz force. This is the force that is used for propulsion. Widely publicized recently, this propulsion concept is definitely capable of Solar System missions, but the weak thrust at this time and in the foreseeable future, as in the case of the solar sail concept, makes it incapable of meeting the travel-time criterion. Unfortunately none of the discussed systems are capable of anything approaching light speed. As stated, these propulsion systems confine us to our Solar System and long-duration missions (10 years or longer to Pluto). Chapter 9 will discuss some of those possibilities that might let us travel beyond our solar system, that is reach the speed of light quickly and travel in "hyperspace" to our distant destinations.